I found it interesting that a commenter on the video stated that today Fresno is often dissed as being the most midwestern-like city in California. 'Tis a beautiful thing, that. Wonder how many years elapsed between the creation of the Fulton Street Mall in 1964 and its being paved over. Think the bus-trams are still running? -yeah, I thought those open mini busses in the video were so pathetic. 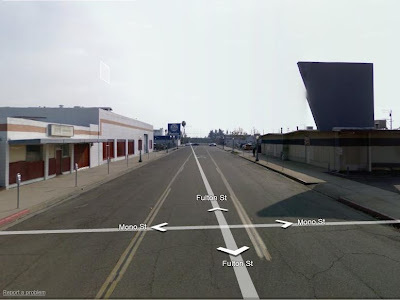 Apparently portions of Fulton street are still pedestrian only. 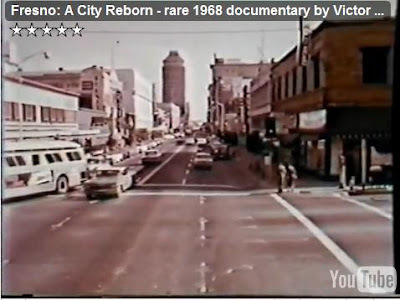 This plan was implemented for several years, but since it involved so much de-population and catering to the auto, the town declined even faster..
Glad you enjoyed the video. Your before/after photos are not quite accurate. The 6-block portion of Fulton Street that was converted into a pedestrian mall in the 1960's is still a mall to this day. Nothing has been paved over, although there has been lots of talk over the past 45 years about opening it to traffic. The Fulton Mall area is currently undergoing an EIR and specific plan study which will decide if the mall is opened, among other things regarding our downtown revitalization.